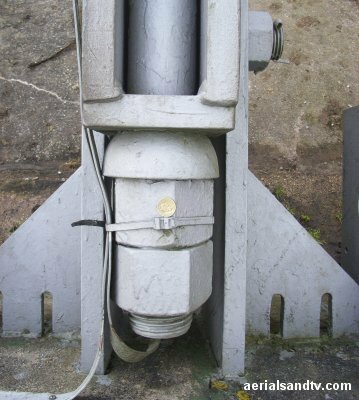 Close up of one of Mendip television transmitters stay tensioning assemblies where it attaches to the anchor block. Note the £1 coin (to give an idea of the scale) and also the earthing straps. 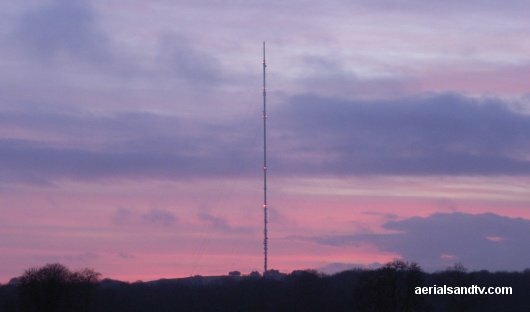 Mendip television transmitter at dusk, looking towards the South West. That`s a big piece of concrete (and there`s a lot more of it underground)...... One can imagine how much pull is exerted on the stay lines (particularly in a high wind) by the size of the block required to anchor it. 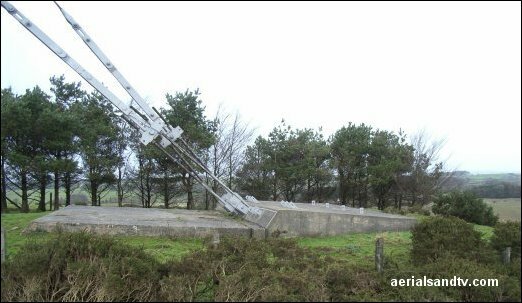 Mendip television transmitter (TX) is situated 18 miles South of Bristol. It is a "guyed mast" structure (309m in height see How High is High?) and is identical to Waltham and Bilsdale. It was built in 1967 by British Insulated Callender`s Cables (or B.I.C.C) who were responsible for much of the infrastructure built in this country from 1945 up to the 1980s. The company is still going but now called Balfour Beatty. The mast is a tubular structure to the top and has in internal lift, though this is thought to be out of use following the accident at Belmont. Mendip transmitter was originally owned by the BBC before being sold off to Crown Castle then to National Grid Wireless and finally to Arquiva (sic). Mendip has no railways within 12 miles of it now but the old Somerset & Dorset line (from Bath to Bournemouth) used to run only three miles to the west of it. The S & D was opened between 1862 and 1874 but finally closed in 1966, thus no travellers on it would have seen the transmitter as it was opened in 1967 ! 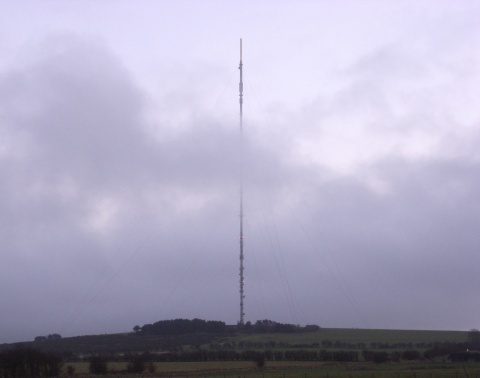 Mendip is a powerful transmitter, it has the joint eighth highest output in the country but it still needs fifty four smaller repeaters to improve its coverage in areas of poor reception due to the hilly terrain in its coverage area. Mendip transmitter is horizontally polarised. It was originally (for analogue, then, initially, for digital) a C/D group. When MUXES 7 & 8 came along it went E group (or wideband), see the graph for Mendip. 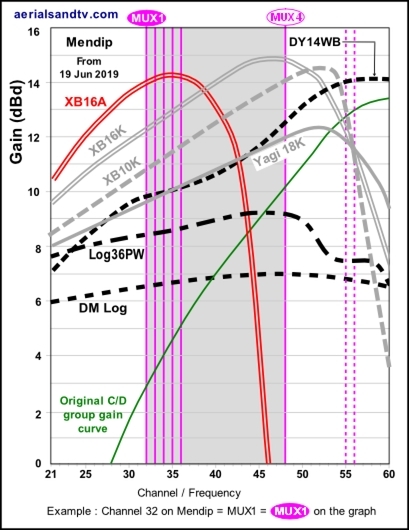 Eventually, by June 2019, it`ll end up a K group (excl MXES 7 & 8, though they will be turned off by about 2022), though all but MUX 5 will be within the A group, which is a handy option for those in a poor signal area. Mendip has a population coverage of around 1.5 million and its signals are picked up in many towns/cities including Bristol, Bath, Chippenham, Weston Super Mare and areas of South Wales including Cardiff. In fact there are a lot of houses in Cardiff which can actually see Wenvoe transmitter, but still use Mendip ! For Mendip we recommend the DM log for strong signal areas, the Log36 for medium signal areas, the Yagi 18K for poor signal areas, and the DY14WB for those with worst signals. For those in particularly poor signal areas it should be noted that from June 2019 only MUX4 will be out of the A group, so, if you live a poor signal area we recommend the Yagi18A or the XB10A for poor signal areas, and the XB16A for those with the most marginal signals. The channel guide below also includes the same information for Rowridge, Stockland Hill, Wenvoe, Ridge Hill, Bristol Kings Weston, Bristol Ilchester, Oxford, Hannington and Salisbury. This data can be of great use in determining possible alternative transmitters to try if Mendip fails to give an adequate signal, see the importance of “Line Of Sight”. Notice how all the transmitters outputs dovetail together particularly Ridge Hill, Mendip and Wenvoe. The channel allocation guides can also be very useful in the diagnosis of co-channel interference problems and can also be invaluable if you are trying to find a spare channel for a modulated output (e.g. for a Sky box or CCTV system) to be added to your TV setup/distribution system without suffering from co-channel. 700MHz clearance is due at Mendip in between the 4 Apr and 19 Jun 2019, when it will become a K group on CHs 32 to 48 (excl MUXES 7 & 8). NOTE : In Feb 2018 MUX 5 dropped down the band (and out of the C/D).